As the 2016 presidential campaign begins to take shape, Washington experience has become less of a potential asset for those seeking the White House. A new national survey testing candidate traits finds that 30% would be less likely to support a candidate with “many years” of experience as an elected official in Washington, while 19% would be more likely to support such a candidate. About half (48%) say it would not matter if a candidate had long Washington experience. By contrast, early in the 2008 presidential campaign, more than twice as many saw lengthy Washington experience as a positive than negative trait for a presidential candidate (35% more likely vs. 15% less likely). A separate measure dating back to the late 1980s shows an even larger decline in the perceived value of Washington experience. The question asks which better prepares someone to be president – serving as a senator or member of Congress or as a state’s governor – and mentions possible advantages of each position. In the case of a member of Congress, it would be acquiring experience in Washington and foreign policy; a governor is described as able to gain experience as head of an administration. In 1987, 66% said experience as a member of Congress provided better preparation for the White House while just 22% said serving as governor was better preparation. In 2007, two decades later, congressional experience was still preferred by more than two-to-one (55% to 24%). 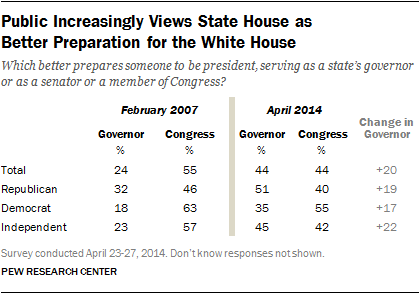 But today, the public is divided: 44% say serving in Congress better prepares someone to be president while as many say experience as governor is better preparation. The latest survey by the Pew Research Center, conducted April 23-27 among 1,501 adults, finds that military service continues to rank as the most valuable asset for a presidential candidate among 16 traits and characteristics tested. Overall, 43% say military experience would make them more likely to support a presidential candidate, while just 4% say it would make them less likely; 53% say it wouldn’t matter in their vote. Military service also was the top attribute for presidential candidates early in the 2008 and 2012 campaigns. Serving as a state governor and having experience as a business executive also continue to be seen as clear positives for candidates. A third say they would be more likely to support a governor compared with just 5% who would be less likely; experience as a business executive also is viewed as a net positive (33% more likely vs. 13% less likely). Majorities say experience as a governor and business executive would not matter to them. On the other side of the ledger, not believing in God and never having held elected office before are the most negatively viewed traits of those tested. Just over half (53%) say they would be less likely to vote for someone who does not believe in God, while only 5% say this would make them more likely to support a candidate. And despite a decline in regard for extensive Washington experience, a presidential candidate who has never held any elected office would have little appeal: 52% say this would make them less likely to vote for a candidate compared with just 9% who say this would increase their likelihood of supporting a candidate. The survey finds that at a time of increasing acceptance of homosexuality, most Americans (66%) say it wouldn’t matter if a presidential candidate is gay or lesbian; 27% say they would be less likely to support a gay or lesbian candidate while 5% would be more likely. 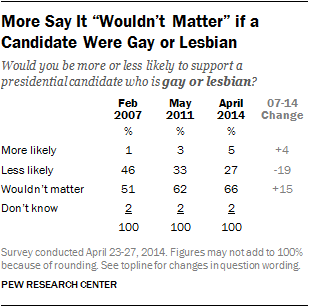 In 2007, nearly half (46%) said they would be less likely to vote for a homosexual candidate. With Hillary Clinton a much talked about potential candidate in 2016, 71% of the public say it would not matter if a presidential candidate is a woman; 19% say they would be more likely to vote for a female candidate, while 9% would be less likely. A higher percentage of women (24%) than men (14%) say they would be more likely to support a female candidate, though large majorities of both women and men say it wouldn’t matter. But many liberal Democrats find the idea of a woman candidate appealing: 40% of liberal Democrats say they would be more likely to support a female presidential candidate, nearly double the share of conservative and moderate Democrats (23%). Among Republicans, about as many would be less likely (15%) as more likely (10%) to support a woman candidate; 74% of Republicans say it wouldn’t matter. When it comes to a presidential candidate’s age, it’s better to be younger than older. More than a third say they’d be less likely to support a candidate in their 70s (36% less likely, 6% more likely, 55% no difference). By comparison, 16% say they would be more likely to vote for a candidate in their 40s, while just 6% say they would be less likely; a large majority (77%) say it would not matter if a candidate is in their 40s. Fewer Americans have a negative impression of a candidate in their 70s than did so early in the 2008 campaign, when Sen. John McCain was an early frontrunner for the GOP nomination. 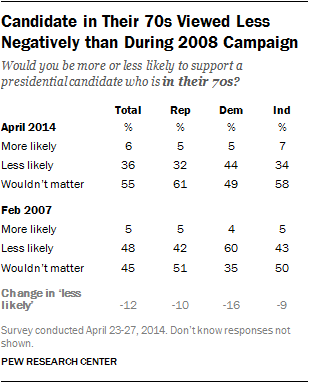 Currently, 36% say they would be less likely to vote for a candidate in their 70s, compared with 48% in February 2007. The change since then has been particularly notable among Democrats. Seven years ago, a majority of Democrats (60%) said they would be less likely to back a candidate in their 70s; 44% say that today. Even with this change, more Democrats than Republicans (32% less likely) would have a negative impression of a candidate in their 70s. There are only modest partisan differences in opinions about a candidate in their 40s. And there is not much of a connection between people’s ages and their views of a presidential candidate’s age, either one in their 40s or one in their 70s. Republicans, by a 51% to 40% margin, say serving as a governor rather than as a member of Congress is better preparation for the presidency. That is a substantial shift from early 2007, when more Republicans believed experience in Congress (46%) than as a governor (32%) better prepared someone for the White House. Democrats and independents also increasingly see gubernatorial experience as more valuable. Among both groups, the shares saying serving as governor provides better preparation for the presidency has roughly doubled since 2007. 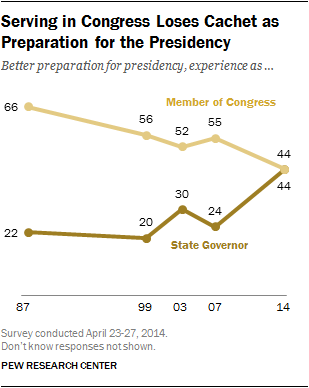 Still, more Democrats say experience in Congress (55%) than as a state governor (35%) better prepares someone to be president. Independents are divided (45% governor, 42% member of Congress). In addition the share of Americans who say they would be less likely to back a candidate who has been an elected official in Washington for many years has doubled – from 15% to 30% – since 2007. Among Republicans and independents, about twice as many now see lengthy political service in the nation’s capital more negatively than positively, and Democrats’ views are mixed (26% more likely vs. 20% less likely). Republicans and Republican leaners who agree with the Tea Party have a particularly negative view of extensive Washington experience: 56% say they would be less likely to support a candidate with long service as a Washington elected official, compared with 31% of non-Tea Party Republicans. Meanwhile, service as a state’s governor continues to be viewed as more of an asset than a liability for a presidential candidate. A third (33%) say they would be more likely to favor a candidate who has been a governor compared with just 5% who would be less likely. Republicans (42%) are more likely than independents (32%) and Democrats (29%) to view experience as a governor positively. While military service is the most positively viewed presidential trait tested in the survey, it is a far more popular trait among Republicans than Democrats. About six-in-ten Republicans (63%) would be more likely to support a candidate with military experience, while 35% say it wouldn’t matter to them. By contrast, no more than three-in-ten Democrats (29%) would be more likely to vote for a veteran; most (63%) say it wouldn’t matter to them. Similarly, experience as a business executive would have more appeal for Republicans than Democrats. As many Democrats say they would be less likely (20%) as more likely (18%) to back a candidate who has been a business executive. By contrast, the trait is a clear positive for Republicans: 46% would be more likely to support a candidate with business experience; hardly any (5%) say this would decrease their likelihood of backing a candidate. Roughly a third of Americans (35%), including 46% of Republicans, say they would be less likely to support a presidential candidate who had an extramarital affair. Independents and Democrats find this less troubling, with majorities of both groups saying it wouldn’t matter (70% of Democrats, 61% of independents). Past marijuana use is viewed far less negatively than having an affair outside of marriage. 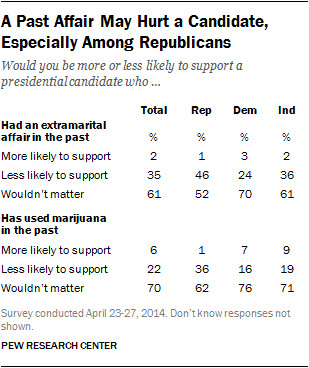 Among the public overall, 22% say they would less likely to favor a candidate who has used marijuana. Republicans (36% less likely) are about twice as likely as independents (19%) and Democrats (16%) to view past marijuana use negatively. As far as a presidential candidate’s ethnicity is concerned, most Americans (80%) say it would not matter to them if a candidate is Hispanic; 9% say they would be more likely to support a Hispanic candidate while an identical percentage would be less likely. Among Hispanics, 35% say they would be more likely to support a Latino candidate, while just 4% say they would be less likely to support such a candidate and 58% say it wouldn’t matter to them. Most whites (85%) and blacks (83%) say a candidate being Hispanic wouldn’t affect their vote. As in the past, the public would have a very negative reaction to a presidential candidate who does not believe in God. Overall, 53% say they would be less likely to support a candidate who does not believe in God, while just 5% would be more likely to support such a candidate; 41% say this wouldn’t matter to them. A large majority of Protestants (71%) – including 82% of white evangelical Protestants – say they would be less likely to support a candidate who does not believe in God. Catholics would view an absence of belief in God less negatively (48% less likely), while only about a quarter (24%) of the religiously unaffiliated say they would be less likely to favor a candidate who does not believe in God. A candidate’s identification as an evangelical Christian or Catholic would not matter to most Americans. About one-in-five (21%) would be more likely to support an evangelical Christian; 17% would be less likely and 58% say this wouldn’t be a factor. However, most white evangelical Protestants (58%) say they would be more likely to support a candidate who shares their faith. A substantial majority of the public (81%) say it would not matter to them if a presidential candidate is Catholic. Among Catholics, 23% would be more likely to support a Catholic candidate, while 72% say it wouldn’t matter. There is a sizable partisan divide in views of a candidate’s religion. For Republicans, a candidate being an evangelical Christian is a net positive (36% more likely, 5% less likely); for Democrats, more say it would decrease (27%) than increase (12%) their chances of supporting a candidate. And while 70% of Republicans say they would be less likely to support a candidate who does not believe in God, Democrats are more ambivalent: 42% say they would be less likely to support an atheist, while 49% say it wouldn’t matter to them.